Rasnov Castle is an impressive medieval fortress that dominates the surrounding area and the eponymous Romanian city of its hill. From the village level the views of the castle Rasnov are actually exciting. Not less remarkable are the views opened up by the hill itself. The town and fortress Rasnov are located 12 km southeast of Brasov, in the plane between Bucegi, Pershan and Fagarash which are the heights of the mountain chain of the Southern Carpathians. 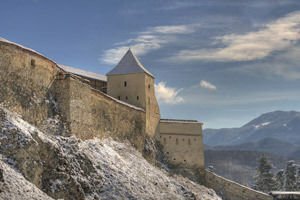 The medieval fortress Rasnov was built sometime in the 13th century, during the time when this world territory was conquered by the Tartars. In the early 13th century, Rasnov Castle appears on the hill, as its main purpose was to protect the local population and that in the surrounding villages who were vulnerable for possible attacks. In this earliest stage of its history the castle Rasnov had no local feudal lord or ruler. However, the solid fort withstood the many attempts to be captured. According to historical sources that document the events in Rasnov, during these centuries around 1331 and 1335 the fortress Rasnov was unable to withstand a major Tatar attack. One such comes about ten years later, in 1345, but this time Rasnov is strong and repels Tatar raids. In the next and the next century is the period of the Ottoman invasion in these lands. The Turks were trying to capture the castle Rasnov in 1421, but unsuccessfully. In 1427 in Rasnov arrives king of Hungary and emperor of the Holy Roman Empire - Luxembourg - Sigismund de Luxemburg, who ruled between 1387-1437 year. Eleven years later, a new siege of the fortress from the Turkish side was again afflicted by the failure of the Ottomans. In the next and all future centuries the Turkish troops did not stop to besiege the fortress Rasnov. It was forced to surrender in April 1612 when lack of water supplies proved detrimental to the Romanians and the fortress was transmitted by Gabor Batory. One interesting legend tells about the deep well, which is located in Rasnov was excavated between 1623-1640 by two Turkish prisoners who in return was promised their freedom. Rasnov Castle ceases to function as a fortress during the 50 years of the last century. Around this time it became a tourist attraction, where today you can visit the interesting historical museum, preserving the precious religious and historical objects and documents. According to some historians, Rasnov castle is one of the seven Bulgarian Transylvanian castles. It probably was built by the Bulgarians in the course of historical events and was then inherited by the Hungarians and Austrians. It is believed that originally the hill above Rasnov was an ancient Roman and Thracian castle, which bore the name - Comidava.